Indian batsman Cheteshwar Pujara, who scored a gritty century on the third day of the first Test against England here on Friday, heaped praised on the visiting team's bowlers who bowled a probing line and made full use of the pitch.India scored 319/4 at stumps on the third day in reply to England's imposing first innings score of 537 runs.Murali Vijay (126) and Pujara (124) forged a 209-run stand for the second wicket to deny England any early inroads after the dismissal of opener Gautam Gambhir (29). At stumps, skipper Virat Kohli was unbeaten on 26 at the Saurashtra Cricket Association stadium here.Nighwatchman Amit Mishra's (0) dismissal ended the day's action. "They bowled good lines, when the ball started reversing it was tough. 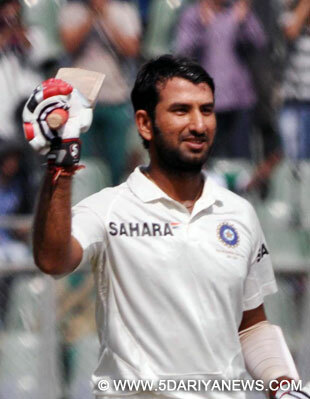 Sometimes you have to respect the bowlers in international cricket," Pujara, who got hit on the helmet three times, said after the match.Speaking of his century in front of his home crowd, Pujara said he wanted to play to his potential rather than thinking about the crowd. "It meant a lot, I just wanted to play to my potential, rather than think about the home crowd. I knew that if I stayed there I would get loose balls," the Saurashtra batsman said.Commenting on how the pitch would behave in the last two days of the match he said: "I'm expecting it to turn from day four and five. Hopefully we can get a lead and then you never know, we have a chance."